Generally takes 5-10 business days. Please feel free to contact us for details. 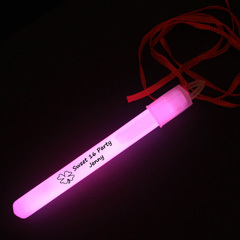 Customized with clear decal of your logo on each glow stick. 2. Visit this page to select size of decal, logo ink color. 4. After place the order, send your logo or words to logo@happyglow.com with your order number. One of our staff will email you mock-up image to proof. We will process your order after your confirmation.